Filming has ended on set of Fergal Costello's new short horror film 'Stephanie' starring Moe Dunford ('Vikings', 'Michael Inside', 'Handsome Devil'), Joe Rooney ('Father Ted', 'Killinaskully') and Aoife Spratt ('Locus of Control', 'Trampoline'). Written and Directed by Fergal Costello, the film follows John (Dunford) as he attempts to protect the titular Stephanie, played by Aoife Spratt, from Morris (Rooney) and his murderous intentions. As the film progresses however, we come to learn that Stephanie is not all she seems, harbouring a monstrous secret of her own. "The film was executed in one-shot, following an extensive rehearsal period and plans to be finished and ready for film festival distribution by August." 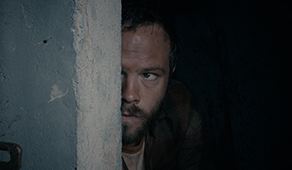 Moe Dunford can next be seen in Lance Daly's Famine feature film 'Black 47' and Brian J. Falconer's 'The Dig'. Other projects currently in post-production include Treasure Entertainment's 'Metal Heart' and Ian Fitzgibbon's 'Dark Lies the Island', which co-stars IFTA winning actors Charlie Murphy & Peter Coonan.